First day of my new age. I'm going to exercise. "I'm not old, I'm not old" I keep telling myself. So I brought Yuki along with me to a local rock climbing/bouldering gym near my house. It's off the Shipai MRT station so it's about a 20 minute walkable distance from my house. 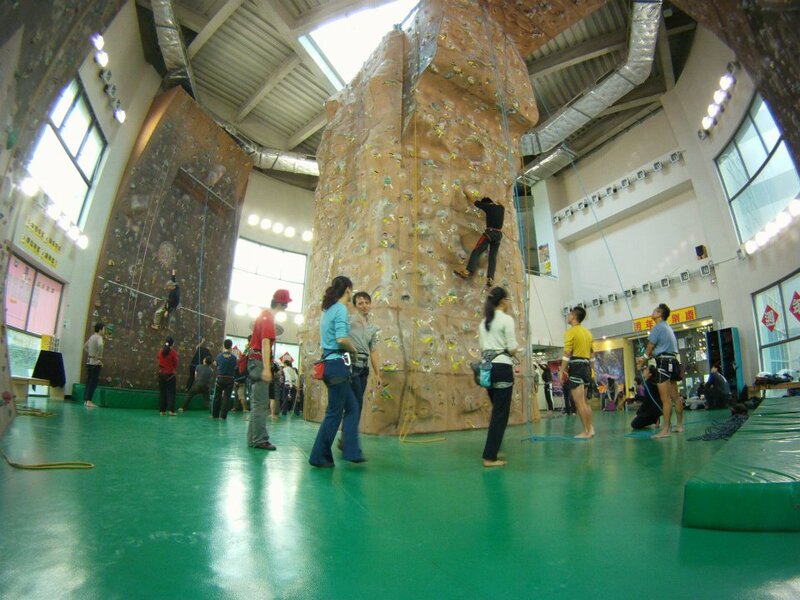 It's a fairly sizable rock climbing gym (They call themselves IDEA) standing at 3 stories tall, inside the much larger Beitou activities center. The Beitou activities center has a olympic size pool, billiards tables, basketball courts, squash/racquetball courts, weights gym, spinning room, fitness room, store and a Moss Burger. Yes, a Mos Burger. Ironic how the only food choice in an activities/fitness facility is a fast food establishment. The rock climbing gym isn't that bad. It definitely has height, but falls short on the space. Most of the space is for belaying. There isn't much space for bouldering (no ropes), which is what I prefer. I found traffic jams a frequent occurrence. There are no overhangs except for the one 50 feet above your head for the advanced belay climbers. If there's a class going on, they boot you off your spot. You can't belay unless you have a license from them. It costs $990 NT and is only held once a month. The marking system is different than the standardized system the US uses. Speaking with a instructor, they say they don't have their own path marked out. All the tape is from other climbers. Sometimes they aren't maintained and they peal off, creating an incomplete path. So you essentially have to create your own path. That can be taken as a positive or a negative. Bouldering fees cost $150 per person all day. $80 for shoe rental. $20 for chalk rental, but it can be shared. But it's reasonable priced for an all day entrance and walking distance from my house, so it'll suffice. Others that don't live near, may not like it as much. I also hear there is a larger, more challenging facility called Y-17 in Taipei city. I'll have to visit that one another day. Well this is good for now, my hands are very crunchy and dry and sore from the climbing. See you when my fingers heal! IDEA is not bad. Depending on where you are there are probably better gyms though. Thats great! I just browsed your website and it's already so useful. I have to thank your efforts into researching/collecting all the information (photos, address, phone number, offerings, time schedule, equipment, description) for people like us into one site. I'll stay posted on your site! Much Thanks!